TMZOrlando Police Chief John Mina addresses reporters on Saturday. Christina Grimmie, a star on “The Voice,” and a popular Youtube singer was shot and killed last night after a concert in Florida in what police say was a planned murder. Grimmie was signing autographs and interacting with fans after her concert at the Plaza Live in Orlando when a man approached and fired around 10:30pm. Grimmie, 22, was rushed to the hospital in critical condition and died shortly after. 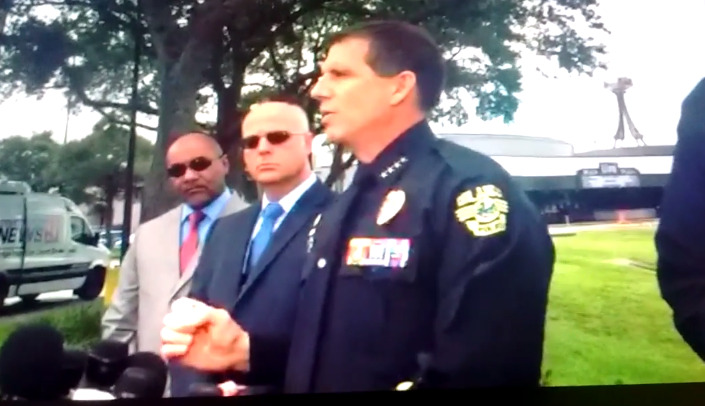 The shooter, an unknown 21-year-old man, had travelled to the concert, and had “plans to travel home,” afterward, indicating he had deliberately targeted Grimmie, according to Orlando police chief John Mina. Grimmie’s brother, Marcus, tackled the shooter to the ground, and the shooter subsequently turned the gun on himself, committing suicide. .
“Marcus’s heroic actions may have prevented further loss of life,” said Mina. The shooter was carrying two loaded, small-calibre handguns, two loaded magazines, and a large hunting knife. There were around 120 people in the venue when the shots were fired but there’s no video footage that police are aware of, according to Mina. The Plaza Live had unnarmed security guards on site, though no pat-downs were conducted at the door. The investigation is ongoing, and Mina expects more details regarding the shooter’s name and possible motives to be released late on Saturday. Orlando detectives will be searching the shooter’s apartment, as well as his computer and phone for possible social media contact with Grimmie. Just woke up to this horrible news about Christina Grimmie, my heart dropped, this one hits home hard. What the hell is wrong with people. Thank you for the music and sharing the word of God. I didn’t expect this. ??? ?